I'm puttering around in the sewing room today. Do I clean it or do I sew? It's hard for me to be creative in a messy environment so I'll probably clean. I found these vintage spools of thread while I was poking around in my mess. Look at the brand name on the bottom two, "Fast to Boiling". I love it! 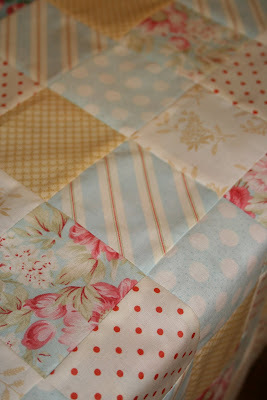 It's so much easier to baste a quilt with curved safety pins when you can actually find them. 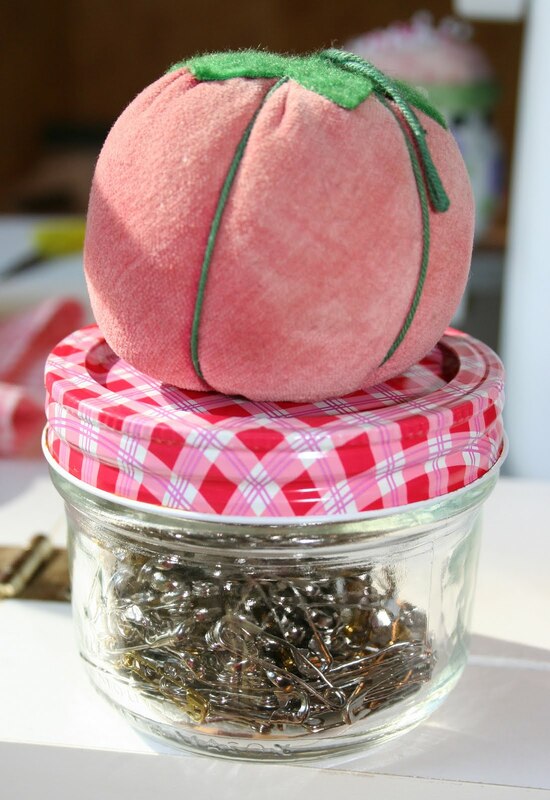 A pretty canning jar does the job perfectly. Now I won't be hunting all over for stray pins to complete a quilt. I took some time to group some of my collections. Of course they all have a pink theme, you know me. Just looking at this shelf makes me smile. 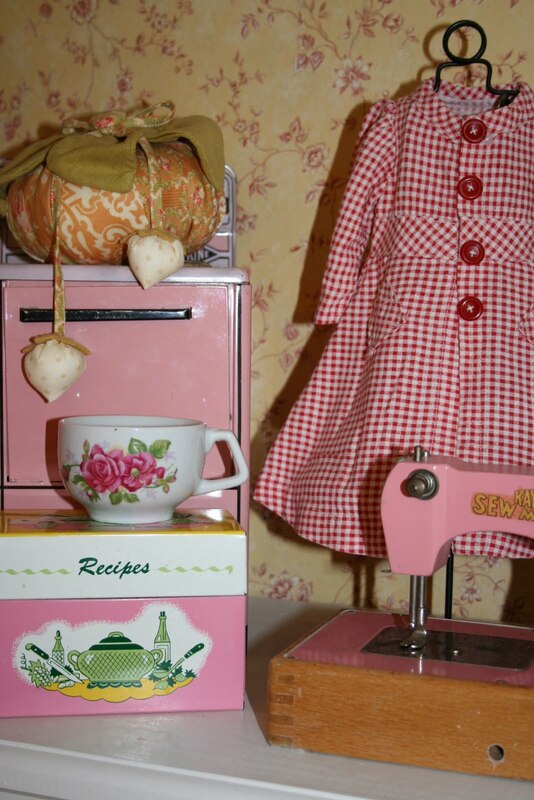 Still madly in love with the pink "Sew Master" toy machine that my friend, Diane, gave me. It even has a vintage spool of thread on it. Tickled pink for sure! The vintage pink "Wolverine" metal kitchen pieces are a favorite. "Kleanser Kate" keeps a watchful eye over all. 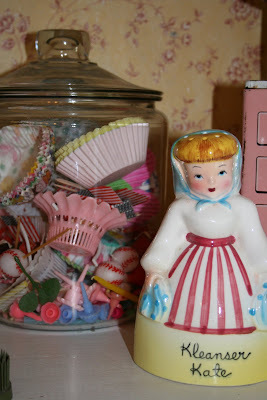 Often when I need a burst of creativity I just look at the jar of vintage cake decorating goodies and all the colors and themes are the jolt I need to get inspired. As I work on a t-shirt quilt for a dear friend, I take breaks to work on this ottoman cover. The colors are just dreamy. Hoping creativity flows from your fingers today in all that you do! Such pretty little vignettes in your sewing room. I'm even sew inspired. Love wooden spools. Wish I would have kept my Mom's. A patchwork ottoman cover. Ohhh I can't wait to see that. Love your fabrics. What a happy post! 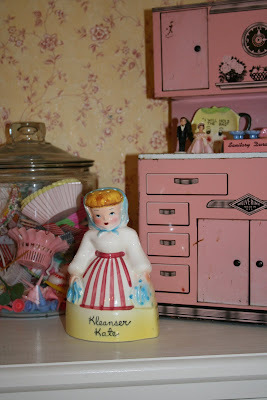 I love all things vintage and I love pink! Thanks for sharing! You have some seriously fun collections. Don't get me started! When I see somebody else's cute stuff, then I start watching out for the same stuff! That can become a problem. I also need to make a t-shirt quilt. We have stacks and stacks of my DD's cross country shirts. They would be much more useful as a quilt. 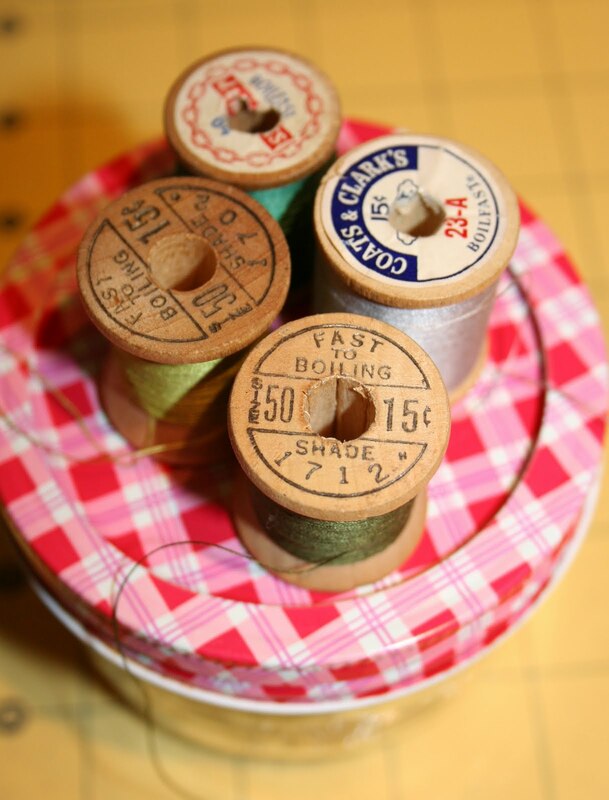 Love those old wooden spools--Looks like they might be from Cortecelli thread--I really miss those old high quality cotton threads! So many lovely things! And yes. I am with you. Must clean before creativity can come. So fun to see what's in your sewing room. I spent the morning cleaning mine out and I was so much more productive afterwards. Thanks for sharing! Enjoyed your post today. Loved all the photos. Cute sewing machine and I love the colors of your ottoman cover. Will look forward to seeing it finished!